My philosophy is simple… respect and honor the human body. Take care of it, nurture it and fill it with positive things, not only when it is sick or symptomatic, but also when it’s working right. Your body as the only vehicle you get for the journey of life. Take care of it and enjoy the ride! I married the woman of my dreams, Dr. Nina Hersch. This also let’s me get adjusted regularly. We are grateful for our two amazing children Ayla and Eva. Family time is important to us, and we try to get as much of it as we can. Outside of the practice, I enjoy exercising, personal growth and pushing myself to the next level. Although I am involved in the healing arts, I’m an avid martial artist and involved in Israeli Combative methodology (Haganah)/ combat fighting / self defense, kick boxing, and Mixed Martial Arts. Paintball is another one of my favorite diversions. I play when I can on a team composed of other great guys from South Florida. I guess you can say I am a kid at heart with some interesting stress relievers! My alter ego, the yang to my yin! We work closely with many local MDs, DOs, and OBGYNs who refer to us when they have patients in the Parkland, Coral Springs and Boca Raton communities that can benefit by seeing a chiropractor. But, enough about me! How can we help you with today’s safe and natural chiropractic care, Acupuncture and massage therapy? Give us a call so we can help you take your first step toward better health. Feel free to call us to discuss your specific needs, or email me using the link below. If we can help you, we will. If we can’t, we’ll tell you that too. Dr. Hersch began practicing in 2000. 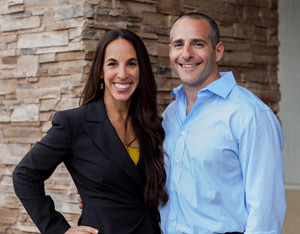 Dr. Nina Hersch received her doctorate of chiropractic from Life University in Atlanta Georgia. She continued her graduate studies in the the areas of pediatric and prenatal chiropractic care. She is also certified to perform an in utero-constraint technique which allows her to help breech babies turn without invasive medical procedures. Her contagious energy is refreshing to see and know. Every visit is a positive experience. Dr. Hersch believes that while medicine may be helpful at times, people of all ages should have proven and powerful alternatives like chiropractic, acupuncture, massage. Right now she has devoted her focus on helping people with Asyra Technology. Dr. Perez became a chiropractor in 2012 after graduating from Life University in Marietta, Georgia. He then moved his wife, Robyn, and 2 kids (Aislynn and Reid) back to south Florida to begin the next phase of their life. They are currently foster parents and are happily in the process of finalizing the adoption of their niece, Paige. As a former National Champion rugby player and 2x All-American wrestler, Dr. Perez understands that injuries can be frustrating and strives to help you get back to your normal daily activities or sport as quickly as possible. He has a passion for treating active minded patients who want to feel good, function well, and be healthy. In his free time, Dr. Perez has been an assistant wrestling coach for the past 2 years at Marjory Stoneman Douglas High School in Parkland, FL. I was born and raised in Israel, earned my Bachelor degree in Physical Therapy in 1993, and I have an extensive experience in treating neurological conditions and pediatrics. In 1998 I graduated from The Traditional Chinese Medicine of Acupuncture School in Miami. In the 17 years of combining Physical therapy and Acupuncture, I have treated pain, allergies, infertility, Parkinson, arthritis and the list goes on, but my passion is treating pediatrics, women, and neurological conditions. I am certified in NAET, JMT, YNSA and Master Tung’s technique, as well as injectable therapies including vitamins, homeopathics, and herbal remedies. I am also the eternal student, learning new techniques continuously, and learning from my patients. Thanks for visiting our site. We look forward to meeting with you in person and learning how chiropractic can fit into your health care goals. Give our Parkland chiropractic office a call or email us and we can arrange a time to explore your options!